This past weekend was YCLA, aka Yarn Crawl Los Angeles. For the third year in a row, for 4 days in April nearly 30 yarn stores come together and throw a party for all those who love yarn. There are special events and collectible pins from each store, and visiting all these yarn stores you’ve never been to before with all your knitter friends. It’s an amazing, if expensive, 4 days, and usually worth all of it. Tomorrow I’ll be posting YCLA: The Bad, but today I choose to tell you all about the fun which was had. I won’t be listing ALL the stores we went to, just the highlights. First stop on Thursday was A Major Knitwork. Last year A Major Knitwork had this fantastic sign out front, and I was pleased to see they brought it back. Then it was across the parking lot to the Yarnover Truck where I realized I once again matched my yarn to my clothes. You’d think this would be a one-off thing, but no. Here’s a hat I worked on this past winter and the top I was wearing that day. Okay. Back to the Crawl. That was it for Thursday. Friday my only stop was to meet my friend Heather at Creative U Studios. I’m taking a class there, so I’ve been up at Creative U pretty regularly lately. I wasn’t going to buy anything, but they had this Dream in Color with Cashmere that was a fantastic raspberry pink. It had to come home with me. Then I remembered Amanda was having an Atenti Trunk Show. I love Atenti bags. They’re made out of beautiful, interesting materials in fabulous color combinations. I wasn’t going to buy one on Friday, because I knew Saturday I was going out with my friends and that was the day I’d spend the most. I was TRYING to be good, so after some internal back and forth I decided to walk away. If, at the end of Saturday, I felt I still wanted the bag, I’d call Amanda and she’d see if they still had it. If not, she’d order for me. Yeah, that lasted until I got out to my car. LOL. Sat for a minute and realized I was going to want the bag at the end of the day tomorrow, so why risk it not being there. Back into the store I went and walked out with this…. I’m VERY picky about what I use on long days like I had on Saturday, and I took a chance on this bag and I don’t regret it for a moment. It held everything I needed and then some, and it did it stylishly and comfortably. Can’t ask for more than that. 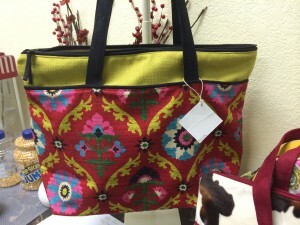 Also, I took a look at the construction of the bag, and it is quality all the way. I love it. 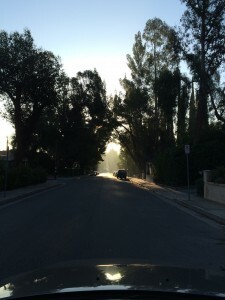 Coffee was up first (a necessity that early on Saturday morning) and then off to Alamitos Bay Yarn Company. I must say, out of all the stores I’d been to over these past three Yarn Crawls, Alamitos Bay really did an amazing job with their store. 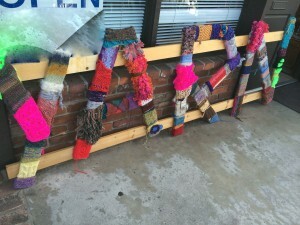 It started with the parking which was coned off and marked for Yarn Crawlers Only. From there they had their back door opened and had a Candyland theme. They had squares laid out for you to follow, a Gingerbread Man for you to take a selfie with (for another entry in another contest), and then filled their store with candy (real and decorative) and embraced the entire theme. They way the flow was changed, it allowed people to go in and browse and then pay, get their passports stamped, and enter any contests as they were heading to their cars. It was really well done. I hope they continue this layout each year, because it really worked. 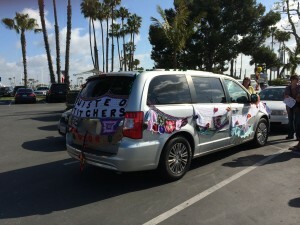 In the parking lot we saw these ladies! 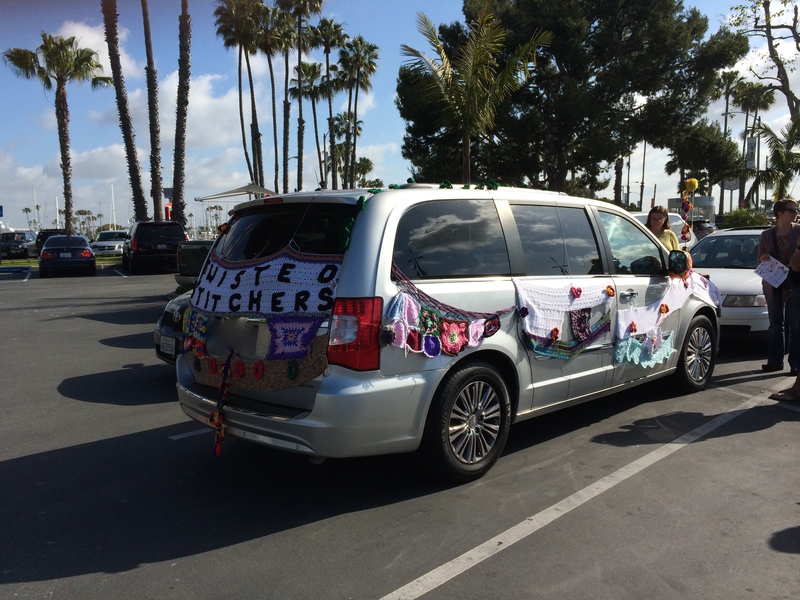 Their entire car was yarn bombed and it was incredible. 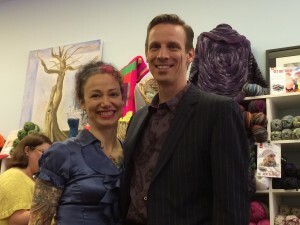 Before lunch we stopped at a new-to-me store, The Knitting Tree in Culver City. 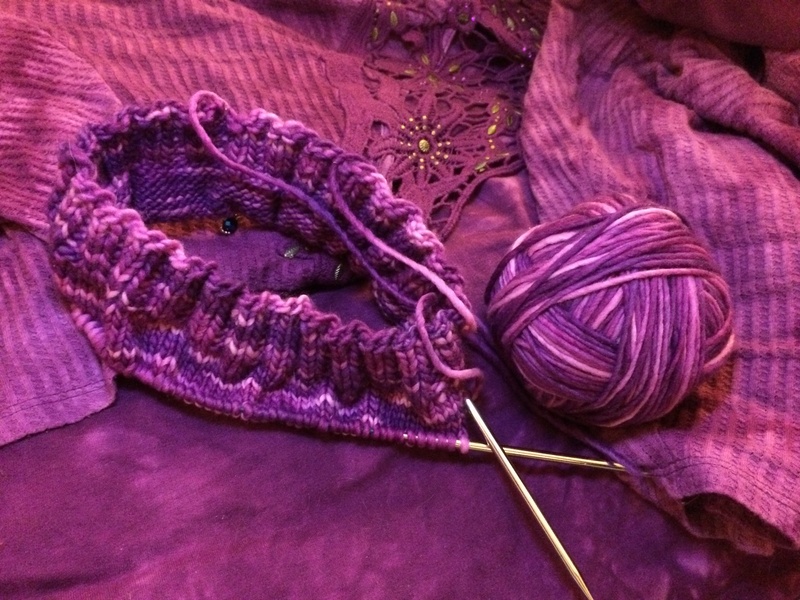 The Knitting Tree is run by Annette who used to be one of the owners of A Mano Yarn Center. (*sigh* I still miss A Mano). Anyway, her new store is a happy, fun, well-stocked, interesting store. I’d expect nothing less from her. It was wonderful to see her again, and she was practically glowing when she told me she and her business partner Bruce were getting married! This is the store where I. Cleaned. House. I have a weakness for Madelinetosh as you know, if you’ve spent any time here, and they had a ton of it. I was looking to knit two kid sweaters (a baby and a toddler) and needed to find the right colors, and she had them in spades. I may have also purchased one or two skeins for myself. Maybe. We had a fantastic lunch at Paco’s Tacos (Thanks for the recommendation, Leo! You were right! Best tacos ever!) and two more stops and then we all hit the wall. We were exhausted! I was home by about 6:30 and asleep by 8:00 p.m. That’s right. Little Miss Night Owl was asleep by 8:00 p.m. on a Saturday night. The four of us had an amazing time. We all enjoyed a gorgeous day hanging out with fellow Yarnies and singing bad 80s music at the top of our lungs. If you think we all resisted belting out the chorus to “Living on a Prayer,” at the top of our lungs, well…you don’t know us very well, do you? At one point we were all laughing so hard we were crying. Sunday Alyson and I went to one of my favorite stores: Colors 91711. They’re always so friendly and it’s a charming, well-stocked, happy store. Sadly, I didn’t purchase anything this time, but that’s pretty rare for me. Colors is the only store EVER where I have checked out their sample and bought both the yarn their sample was knit with IN THE COLOR THEY USED. Seriously. That NEVER happens with me. And not only did they do it ONCE, they did it TWICE. Amazing. 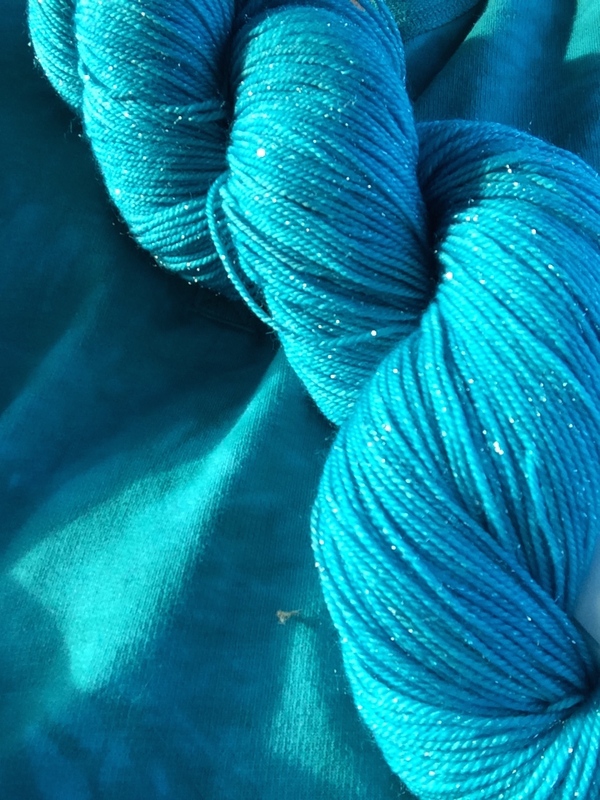 Everybody scored some amazing yarn this year. Through various sale racks at several shops, Heather walked away with enough yarn to make 3 separate sweaters (one with a yarn with about 15% cashmere) and collectively spent significantly less than I spent buying Cascade 220 for my one CustomFit sweater. I bought a ton of Madelinetosh for baby sweaters, and a few random skeins of other yarns for myself. Amy found some Berocco Vintage she had been looking for and got a great deal on it, also in a sweater quantity. All in all an amazing and fun time was had. The stores were all friendly and excited to meet the Crawlers and the Crawlers were happy to be out and meeting so many new people and stores. It was a ton of fun, but I have to say I’m pretty happy with my 2014 YCLA Stash. I didn’t go overboard like I have in the past, but I still bought a bunch of stuff and I don’t regret any of it. I especially don’t regret my new bag. Tomorrow: YCLA: The Bad. You’ve been warned. *SABLE = Stash Acquisition Beyond Life Expectancy.